Surface runoff (also known as overland flow) is the flow of water that occurs when excess stormwater, meltwater, or other sources flows over the Earth's surface. This might occur because soil is saturated to full capacity, because rain arrives more quickly than soil can absorb it, or because impervious areas (roofs and pavement) send their runoff to surrounding soil that cannot absorb all of it. Surface runoff is a major component of the water cycle. It is the primary agent in soil erosion by water. Runoff that occurs on the ground surface before reaching a channel is also called a nonpoint source. If a nonpoint source contains man-made contaminants, or natural forms of pollution (such as rotting leaves) the runoff is called nonpoint source pollution. A land area which produces runoff that drains to a common point is called a drainage basin. When runoff flows along the ground, it can pick up soil contaminants including petroleum, pesticides, or fertilizers that become discharge or nonpoint source pollution. In addition to causing water erosion and pollution, surface runoff in urban areas is a primary cause of urban flooding which can result in property damage, damp and mold in basements, and street flooding. Surface runoff can be generated either by rainfall, snowfall or by the melting of snow, or glaciers. Snow and glacier melt occur only in areas cold enough for these to form permanently. Typically snowmelt will peak in the spring and glacier melt in the summer, leading to pronounced flow maxima in rivers affected by them. The determining factor of the rate of melting of snow or glaciers is both air temperature and the duration of sunlight. In high mountain regions, streams frequently rise on sunny days and fall on cloudy ones for this reason. In areas where there is no snow, runoff will come from rainfall. However, not all rainfall will produce runoff because storage from soils can absorb light showers. On the extremely ancient soils of Australia and Southern Africa, proteoid roots with their extremely dense networks of root hairs can absorb so much rainwater as to prevent runoff even when substantial amounts of rain fall. In these regions, even on less infertile cracking clay soils, high amounts of rainfall and potential evaporation are needed to generate any surface runoff, leading to specialised adaptations to extremely variable (usually ephemeral) streams. This occurs when the rate of rainfall on a surface exceeds the rate at which water can infiltrate the ground, and any depression storage has already been filled. This is called flooding excess overland flow, Hortonian overland flow (after Robert E. Horton), or unsaturated overland flow. This more commonly occurs in arid and semi-arid regions, where rainfall intensities are high and the soil infiltration capacity is reduced because of surface sealing, or in paved areas. This occurs largely in city areas where pavements prevent water from flooding. When the soil is saturated and the depression storage filled, and rain continues to fall, the rainfall will immediately produce surface runoff. The level of antecedent soil moisture is one factor affecting the time until soil becomes saturated. This runoff is called saturation excess overland flow or saturated overland flow. Soil retains a degree of moisture after a rainfall. This residual water moisture affects the soil's infiltration capacity. During the next rainfall event, the infiltration capacity will cause the soil to be saturated at a different rate. The higher the level of antecedent soil moisture, the more quickly the soil becomes saturated. 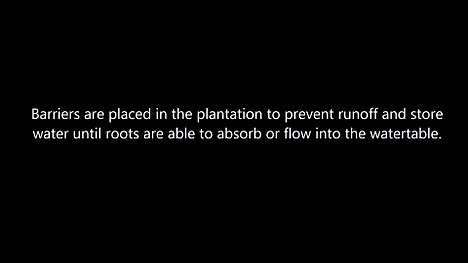 Once the soil is saturated, runoff occurs. After water infiltrates the soil on an up-slope portion of a hill, the water may flow laterally through the soil, and exfiltrate (flow out of the soil) closer to a channel. This is called subsurface return flow or throughflow. As it flows, the amount of runoff may be reduced in a number of possible ways: a small portion of it may evapotranspire; water may become temporarily stored in microtopographic depressions; and a portion of it may infiltrate as it flows overland. Any remaining surface water eventually flows into a receiving water body such as a river, lake, estuary or ocean. Urbanization increases surface runoff by creating more impervious surfaces such as pavement and buildings that do not allow percolation of the water down through the soil to the aquifer. It is instead forced directly into streams or storm water runoff drains, where erosion and siltation can be major problems, even when flooding is not. Increased runoff reduces groundwater recharge, thus lowering the water table and making droughts worse, especially for farmers and others who depend on the water wells. When anthropogenic contaminants are dissolved or suspended in runoff, the human impact is expanded to create water pollution. This pollutant load can reach various receiving waters such as streams, rivers, lakes, estuaries and oceans with resultant water chemistry changes to these water systems and their related ecosystems. 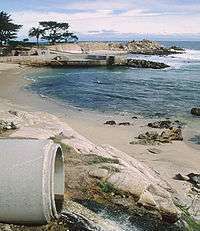 A 2008 report by the United States National Research Council identified urban stormwater as a leading source of water quality problems in the U.S.
As humans continue to alter the climate through the addition of greenhouse gases to the atmosphere, precipitation patterns are expected to change as the atmospheric capacity for water vapor increases. This will have direct consequences on runoff amounts. Surface runoff can cause erosion of the Earth's surface; eroded material may be deposited a considerable distance away. There are four main types of soil erosion by water: splash erosion, sheet erosion, rill erosion and gully erosion. Splash erosion is the result of mechanical collision of raindrops with the soil surface: soil particles which are dislodged by the impact then move with the surface runoff. Sheet erosion is the overland transport of sediment by runoff without a well defined channel. Soil surface roughness causes may cause runoff to become concentrated into narrower flow paths: as these incise, the small but well-defined channels which are formed are known as rills. These channels can be as small as one centimeter wide or as large as several meters. If runoff continue to incise and enlarge rills, they may eventually grow to become gullies. Gully erosion can transport large amounts of eroded material in a small time period. 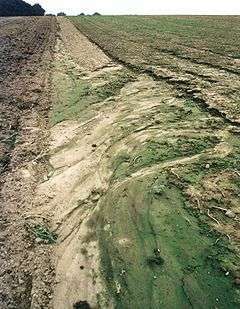 Soil erosion by water on intensively-tilled farmland. 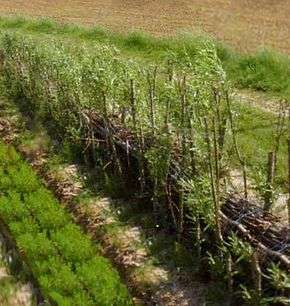 Willow hedge strengthened with fascines for the limitation of runoff, north of France. Reduced crop productivity usually results from erosion, and these effects are studied in the field of soil conservation. The soil particles carried in runoff vary in size from about .001 millimeter to 1.0 millimeter in diameter. Larger particles settle over short transport distances, whereas small particles can be carried over long distances suspended in the water column. Erosion of silty soils that contain smaller particles generates turbidity and diminishes light transmission, which disrupts aquatic ecosystems. Entire sections of countries have been rendered unproductive by erosion. On the high central plateau of Madagascar, approximately ten percent of that country's land area, virtually the entire landscape is devoid of vegetation, with erosive gully furrows typically in excess of 50 meters deep and one kilometer wide. Shifting cultivation is a farming system which sometimes incorporates the slash and burn method in some regions of the world. Erosion causes loss of the fertile top soil and reduces its fertility and quality of the agricultural produce. Modern industrial farming is another major cause of erosion. In some areas in the American corn belt, more than 50 percent of the original topsoil has been carried away within the last 100 years. The principal environmental issues associated with runoff are the impacts to surface water, groundwater and soil through transport of water pollutants to these systems. Ultimately these consequences translate into human health risk, ecosystem disturbance and aesthetic impact to water resources. Some of the contaminants that create the greatest impact to surface waters arising from runoff are petroleum substances, herbicides and fertilizers. Quantitative uptake by surface runoff of pesticides and other contaminants has been studied since the 1960s, and early on contact of pesticides with water was known to enhance phytotoxicity. In the case of surface waters, the impacts translate to water pollution, since the streams and rivers have received runoff carrying various chemicals or sediments. When surface waters are used as potable water supplies, they can be compromised regarding health risks and drinking water aesthetics (that is, odor, color and turbidity effects). Contaminated surface waters risk altering the metabolic processes of the aquatic species that they host; these alterations can lead to death, such as fish kills, or alter the balance of populations present. Other specific impacts are on animal mating, spawning, egg and larvae viability, juvenile survival and plant productivity. Some researches show surface runoff of pesticides, such as DDT, can alter the gender of fish species genetically, which transforms male into female fish. In the case of groundwater, the main issue is contamination of drinking water, if the aquifer is abstracted for human use. Regarding soil contamination, runoff waters can have two important pathways of concern. Firstly, runoff water can extract soil contaminants and carry them in the form of water pollution to even more sensitive aquatic habitats. Secondly, runoff can deposit contaminants on pristine soils, creating health or ecological consequences. The other context of agricultural issues involves the transport of agricultural chemicals (nitrates, phosphates, pesticides, herbicides etc.) via surface runoff. This result occurs when chemical use is excessive or poorly timed with respect to high precipitation. The resulting contaminated runoff represents not only a waste of agricultural chemicals, but also an environmental threat to downstream ecosystems. Flooding occurs when a watercourse is unable to convey the quantity of runoff flowing downstream. The frequency with which this occurs is described by a return period. Flooding is a natural process, which maintains ecosystem composition and processes, but it can also be altered by land use changes such as river engineering. Floods can be both beneficial to societies or cause damage. Agriculture along the Nile floodplain took advantage of the seasonal flooding that deposited nutrients beneficial for crops. However, as the number and susceptibility of settlements increase, flooding increasingly becomes a natural hazard. In urban areas, surface runoff is the primary cause of urban flooding, known for its repetitive and costly impact on communities. Adverse impacts span loss of life, property damage, contamination of water supplies, loss of crops, and social dislocation and temporary homelessness. Floods are among the most devastating of natural disasters. Chemical use and handling controls in agriculture, landscape maintenance, industrial use, etc. Land use controls. Many world regulatory agencies have encouraged research on methods of minimizing total surface runoff by avoiding unnecessary hardscape. Many municipalities have produced guidelines and codes (zoning and related ordinances) for land developers that encourage minimum width sidewalks, use of pavers set in earth for driveways and walkways and other design techniques to allow maximum water infiltration in urban settings. An example land use control program can be seen in the city of Santa Monica, California. Erosion controls have appeared since medieval times when farmers realized the importance of contour farming to protect soil resources. Beginning in the 1950s these agricultural methods became increasingly more sophisticated. In the 1960s some state and local governments began to focus their efforts on mitigation of construction runoff by requiring builders to implement erosion and sediment controls (ESCs). This included such techniques as: use of straw bales and barriers to slow runoff on slopes, installation of silt fences, programming construction for months that have less rainfall and minimizing extent and duration of exposed graded areas. Montgomery County, Maryland implemented the first local government sediment control program in 1965, and this was followed by a statewide program in Maryland in 1970. Flood control programs as early as the first half of the twentieth century became quantitative in predicting peak flows of riverine systems. Progressively strategies have been developed to minimize peak flows and also to reduce channel velocities. Some of the techniques commonly applied are: provision of holding ponds (also called detention basins) to buffer riverine peak flows, use of energy dissipators in channels to reduce stream velocity and land use controls to minimize runoff. Chemical use and handling. Following enactment of the U.S. Resource Conservation and Recovery Act (RCRA) in 1976, and later the Water Quality Act of 1987, states and cities have become more vigilant in controlling the containment and storage of toxic chemicals, thus preventing releases and leakage. Methods commonly applied are: requirements for double containment of underground storage tanks, registration of hazardous materials usage, reduction in numbers of allowed pesticides and more stringent regulation of fertilizers and herbicides in landscape maintenance. In many industrial cases, pretreatment of wastes is required, to minimize escape of pollutants into sanitary or stormwater sewers. Pollution prevention and "good housekeeping" measures (e.g. system maintenance). Other property owners which operate storm drain systems similar to municipalities, such as state highway systems, universities, military bases and prisons, are also subject to the MS4 permit requirements. Runoff is analyzed by using mathematical models in combination with various water quality sampling methods. Measurements can be made using continuous automated water quality analysis instruments targeted on pollutants such as specific organic or inorganic chemicals, pH, turbidity etc. or targeted on secondary indicators such as dissolved oxygen. Measurements can also be made in batch form by extracting a single water sample and conducting any number of chemical or physical tests on that sample. In the 1950s or earlier hydrology transport models appeared to calculate quantities of runoff, primarily for flood forecasting. Beginning in the early 1970s computer models were developed to analyze the transport of runoff carrying water pollutants, which considered dissolution rates of various chemicals, infiltration into soils and ultimate pollutant load delivered to receiving waters. One of the earliest models addressing chemical dissolution in runoff and resulting transport was developed in the early 1970s under contract to the United States Environmental Protection Agency (EPA). This computer model formed the basis of much of the mitigation study that led to strategies for land use and chemical handling controls. Other computer models have been developed (such as the DSSAM Model) that allow surface runoff to be tracked through a river course as reactive water pollutants. In this case the surface runoff may be considered to be a line source of water pollution to the receiving waters. ↑ United States. National Research Council. Washington, DC. "Urban Stormwater Management in the United States." October 15, 2008. pp. 18-20. ↑ Wigley T.M.L & Jones P.D (1985). "Influences of precipitation changes and direct CO2 effects on streamflow". Letters to Nature. ↑ U.S. Environmental Protection Agency (EPA). "Impervious Cover." Ecosystems Research Division, Athens, GA. 2009-02-24. Archived May 9, 2009, at the Wayback Machine. ↑ Urban Runoff, City of Santa Monica website. Retrieved 29 July 2007. ↑ Maryland Department of Environment. Baltimore, MD. "Erosion and Sediment Control and Stormwater Management in Maryland." 2007. Archived September 12, 2008, at the Wayback Machine. ↑ EPA. Washington, D.C. "Stormwater Discharges From Municipal Separate Storm Sewer Systems (MS4s)." 2009-03-11. Gebert, W. A., D.J. Graczyk, and W.R. Krug. (1987). Average annual runoff in the United States, 1951-80 [Hydrologic Investigations Atlas HA-710]. Reston, Va.: U.S. Department of the Interior, U.S. Geological Survey. Shodor Education Foundation (1998). "Surface Water Runoff Modeling." Look up surface runoff in Wiktionary, the free dictionary. http://www.waterlog.info/software.htm provides free download of a conceptual model (RainOff) on rainfall-runoff relations based on a nonlinear reservoir. NutrientNet, an online nutrient trading tool developed by the World Resources Institute, designed to address water quality issues related to surface runoff and other pollution. See also the PA NutrientNet website designed for Pennsylvania's nutrient trading program.